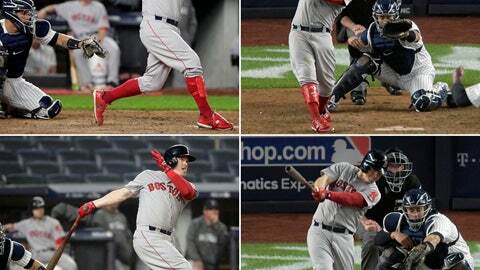 NEW YORK (AP) — Becoming the first player to hit for a postseason cycle earned Brock Holt a return to the Boston Red Sox bench. Ian Kinsler was back at second base Tuesday night for Game 4 of the AL Division Series against the New York Yankees and left-hander CC Sabathia. Holt, a left-handed batter, had four hits and five RBIs in Boston’s 16-1 rout Monday night, his first appearance in the series. His cycle came in the 1,562nd postseason game in major league history, according to the Elias Sports Bureau. The right-handed-hitting Kinsler is 3 for 9 in the series with one RBI and five strikeouts. Cora inserted Eduardo Nunez at third base in place of Rafael Devers, who started Game 3. Christian Vazquez was behind the plate for the second straight night after Sandy Leon started the first two games. Steve Pearce was at first base for the second consecutive night; Mitch Moreland left Game 2 after hurting his right hamstring while running the bases. Boston leads 2-1 in the best-of-five series.